Chiles are a Mexican food staple and can be dated as far back as the Aztecs and Mayans where they were a major part of their diet along with tomatoes, corn, and squash. A lot of the available food sources did not have much flavor, so they added chiles to help season them. They ate chiles with almost every meal, even adding them to their cocoa to make a chile-chocolate drink. Green chiles (4 to 9 in. 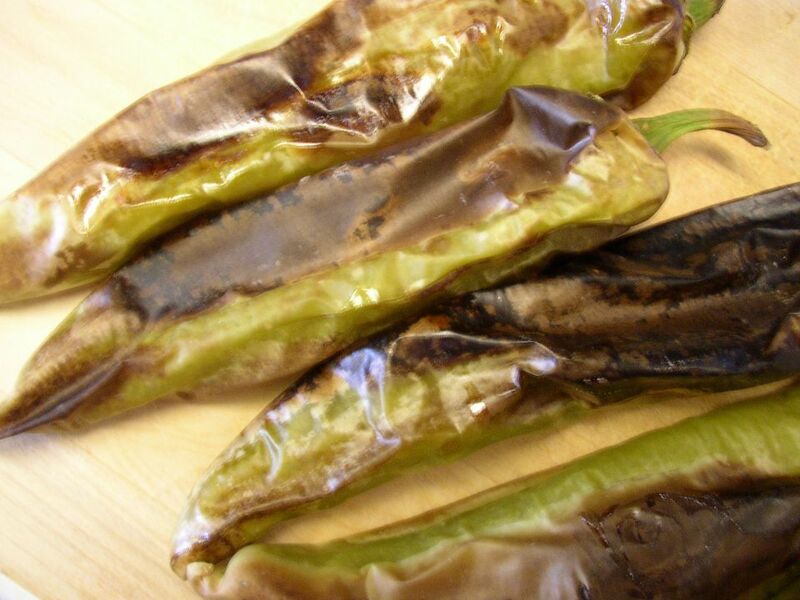 ), such as poblano, Hatch, Anaheim, California, or another local green chile. Begin by preparing your heat source. You will need something extremely hot to char the chiles with. An open flame, such as a grill, is best but you can also roast them in a hot pan or under a broiler. Turn up the heat and begin roasting the chiles by turning them frequently over the heat source. Roast them until the skins are blackened and blistering. The skins do not need to be solid black, just blackened in areas and the rest of the skin should appear loosened and browned. It should take about 10 minutes over an open flame or in a broiler, and 15 to 20 minutes if you roast them in a pan. Once the skin is thoroughly charred, remove the chiles from the heat source and into a bowl. Cover the bowl loosely so that the hot roasted chiles create steam. You can cover the bowl with aluminum foil, a lid, or a dish towel. Let the chiles steam for about 10 minutes. This helps to loosen the skins even more, but this step can be skipped if time is of the essence. When the chiles have cooled enough to where you can touch them, begin peeling of the skin. The skin should peel off easily, but if it is being stubborn, you can run it under warm water while peeling. This will remove some of the chiles flavorful oils and should only be done if the skin is hard to remove. If you are using the green chiles for rellenos (stuffed chiles) use a knife to cut a two-inch slit from the stem and down the side and use a spoon to carefully scoop out the seeds. Roasted chiles tear very easily so go slowly and take your time. If you're using the chiles for anything else, you can cut the stem portion off and then slit the remaining chile down the entire side and open it up. Use a spoon to scrape the seeds off. Discard the seeds and stems and use the roasted green chile in your recipe.